In step 2: Add your data, you immediately have the option to tell Datawrapper which columns you want to have represented as the size of the shapes and their colors. You can leave them empty if you want to; or can just choose to define one of them. 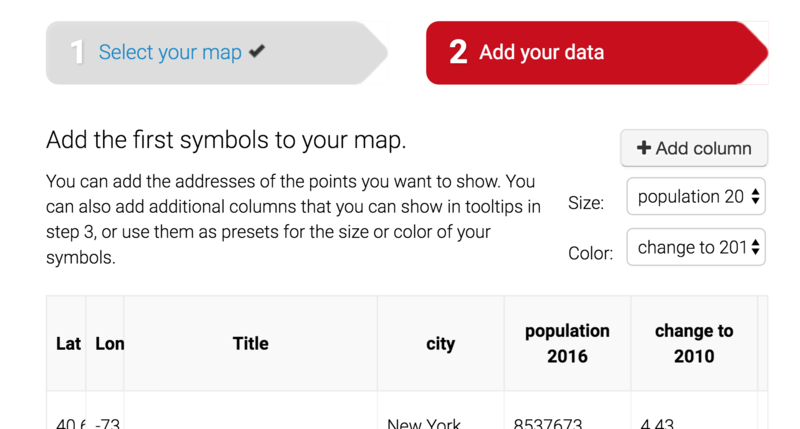 For our map, we'll choose columns to define both, size and color. We want the circles differently big depending on the population numbers. And we want them to be differently colored depending if the city shrank or grew since 2011. Symbol shape: Here you can decide which geometric shape your symbol should have. Squares, Diamonds and Hexagons are great options for clustering, as we'll see later. Triangles (up and down) can be used to show a development (e.g. a city with shrinking population). And markers are especially great if you don't choose a column for "size"; meaning, if all your symbols are exactly the same size. Maximum size: This option defines how large the symbols should appear on the size. You can try around a bit to find a good solution: Too small, and it's hard to see them. Too big, and they're overlapping each other too much. Map padding (%): With this slider, you can decide how much whitespace you want surrounding your map. Make map zoomable: That makes...well, the map zoomable. You will see that this succeeded if your map gets a grey minus & plus button at its top-right corner. In the Appearance panel, you will also find the color options. If you didn't choose a data column for the color, you'll see a simple color picker. Click on it to define which color all your symbols should have. Color Picker: Here you can choose between seven different color palettes. The four palettes at the top are great if your values go from low to high (eg. population, unemployment rates, life expectancies). The three palettes at the bottom are useful when the extremes in the data are most interesting. E.g. if you want to compare your regions with a national/global average, and want to draw attention to the regions that are the furthest away from this average. With Reverse, you can turn around the color palette you chose. Discrete turns the gradient into specific colors that are visually clearly separated from each other. With Import, you can import your own color palette in form of multiple hex codes (e.g. '#ffffe0', '#ffe0a9', '#ffbe84'). With Export, you can export your current color palette in the same format. That's useful if you want to create multiple maps with the same color palette: Export it from one map and import it to your other maps. Stops: This feature will (simply speaking) increase the contrast of your maps; especially if your data has a lot of outliers. The number of stops is the number of (equally big) parts on our color palette which cover the same amount of our values – and because that's not intuitive at all, we wrote an extra article that explains color palettes (incl. stops) in more detail. For our map, we choose a circle with a maximum size of around 35. We want to the reader to quickly identify the cities that shrank since 2010, and colors are perfect for that: All circles with a "change" value smaller than 0 will be shown in dark blue; all other values in green. If you have too many points on your map, especially in one area, the map quickly becomes chaotic. Your reader will have a hard time drawing conclusions from such a packed map. The clustering feature exists to help out with such a problem. By default, it is turned off. But once you activate it (with choosing either "cluster overlapping symbols" or hexagonal binning"), you'll find that this is a powerful tool on its own. So what does clustering do? It puts multiple map points in "bins"; it clusters them. For example, we have lots of smaller cities in the Los Angelos area (41, to be exact). The hexagonal binning sums them all up in one hexagon. Attention: You need to choose "hexagon" as symbol shape in the "Appearance" panel to create a hexagon map. Which color options do we have for these hexagons? Clustering is not made (yet) to visualize the number of points in one hexagon. But we can use the "Color" feature at the bottom of the Clustering panel to sum up variables that we have for all our location points. Imagine we map all Walmart stores in the US and set the size of each store to show their yearly revenue. Because there are thousands of stores, it's hard to see the pattern in the data. There are be many tiny symbols; some slightly bigger, some slightly smaller. But that's a perfect use case for the Clustering feature. When we cluster our Walmart store map, we can tell Datawrapper that it should summarise the yearly revenue in the bins. A hexagon on this map has a darker color if the revenue of ALL the Walmart stores in this hexagon is unusually high. We can't sum up all data like this. Our population-in-biggest-US-cities map is not made to be summed up like this since we only show the biggest cities – and now all of them. The data we cluster and summarise needs to be complete (all Walmart stores, all cities, etc.). We're planning to write an own article to explain this tool better. For now, the best way to learn more about this panel is to play around with it (try to zoom in and out your map, while doing so). Title: Here you can define what will stand above your map key. Pro tip: HTML works here, so a <br> will result in a line break. Number format: If you imported percentages without the %-sign or have giant numbers that you rather see written as "30M" instead of "30.000.000", then this feature helps you to fix that. Position: Here you can move the map key to any corner of your map. That's often a purely aesthetic decision, depending on where your map gives you space. A click on "Customize Tooltips" will open a pop-up window, in which you can find the columns you imported as blue buttons on the top-right corner. Click on them to integrate them in your tooltips. Here too, we wrote an extra article that explains how to add tooltips to your map and points out good practices. We recommend writing in the title what's interesting about the map – the one key statement that you want to show on this map, if you have one. E.g. "Unemployment highest in the south"
Think of notes as footnotes, where you want to specify any abnormalities about your data. E.g. "California unemployment rates from Jan and Feb 2016 not included in the calculation." In this last tab, you can decide in which layout your chart should be published. Should it come in the Datawrapper design? Or (if you or your organization decided to style a chart) in the design of your organization? You can also enable Social Sharing here. If you do that, the share buttons for Facebook, LinkedIn and Twitter will appear on the top-right corner of your map. In this tutorial, we gave a quick overview of all options that you have to customize your Symbol map. You can find more detailed explanations about the color palette, tooltips and custom map keys in other articles.